…I re-read the Bible and discovered the same phenomenon I had witnessed was somewhat accurately described at various places from Genesis through Revelations. The manifestation of angels from and God himself in a cloud (cloud of fog?) seemed extremely important. God spoke from a cloud several times and from other places where the prophets couldn’t see him, just as I and those with me heard a voice from what seemed to an invisible being who was sometimes in a cloud or fog – and was sometimes not. Some of the angels of the Old Testament seemed to be ordinary men who surprisingly appeared from out of nowhere, just like the men we saw who seemed to arrive from nowhere, especially during the long encounter just behind the Sheridan Creek cabin and other encounters like it. 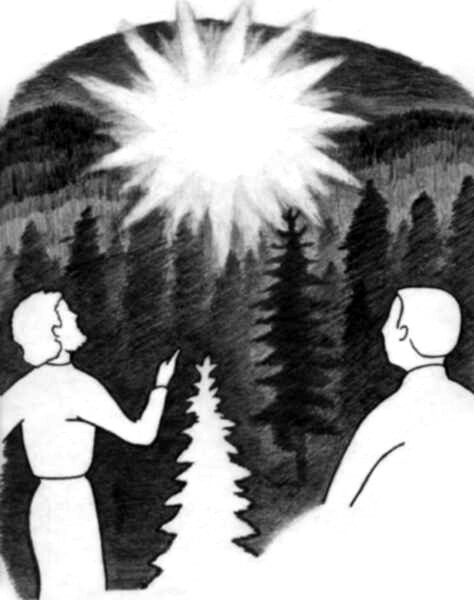 Even the Transfiguration episode that involved Christ, Moses and Elijah was most pertinent: Moses and Elijah (who had already gone to Heaven) seemed to appear from out of nowhere and there seemed to be a bright light that made them and Jesus shine. Then a cloud overshadowed them and what must have been “God” talked to them from the cloud. The brilliant light that shone down from several craft also made others and me shine or be visually transfigured, especially when others saw my bones through my flesh, and when I saw a few others illuminated in some very strange ways. I’m not trying to suggest here that I’m on the same spiritual level as the historic Jesus or any better than anyone else, just that what I and others have experienced and witnessed is somewhat accurately described at various places in the Bible. I know many other contactees have experienced the same. The similarities not only validate the truth of my experiences and others’ experiences, but also parts of the Bible. Unfortunately there is not room here to cover all of the similarities and suggested implications in detail. However, many similarities between UFO phenomenon and the Bible are covered in Dr Jim Deardorf’s book “Celestial Teachings.” The book deals with an old manuscript, “The Talmud of Jmmanuel,” that was discovered through Billy Myers and his UFO experiences in Switzerland. Both books throw even more controversy on the question of UFOs and the Bible. There are also other books that compare UFOs with the Bible. Dr Deardorf was the first, to my knowledge, to point out the possible UFO connotations concerning what seemed to be the unusual house that Jesus got in at times. In Chapter 9 of the book Eminent Discovery I describe a time when I was given a demonstration, out-of-body — a demonstration that seems very similar to what is described as “The Rapture” in The Bible. Throughout the entire 46+ years of my encounters others and I heard the voice speak to us under a variety of conditions and we very mysteriously noticed what seemed to be normal but strange men who just seemed to have arrived from nowhere. They just suddenly seemed to be there beside us, or we saw them walk up to us. A few times I noticed they came walking out of a volume of distorted atmosphere. They normally knew that we were there and explained to us what was taking place at the time. They also gave us lectures and information related to history, the brotherhoods (ancient and modern), the development of the USA, and the future, etc. The craft we encountered also can be described to some extent similar to some of the strange phenomenon described in The Bible. The phenomenon we witnessed and the information we were given (including the way it was given) also is similar to many descriptions in The Bible’s Old Testament…and other ancient writings.